Did anyone see the cheese-themed Bud Light ad during the Super Bowl tonight? Here's the premise: guy goes with his partner to a "wine and cheese party." 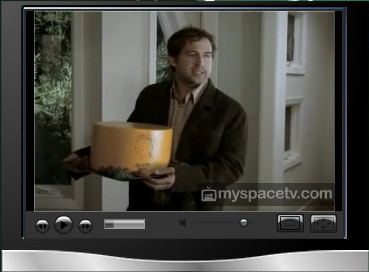 Guy brings huge hunk of cheese with him. Takes it into the kitchen where the other guys are hanging out. "Dude, that's some serious cheese." Pulls the top off, and inside is a six-pack of Bud Light, a sight that duly impresses his bros. One of his friends pops open a baguette to reveal another bottle. The punchline? The box of wine is a portable TV set (with a football game playing on it of course). So...is the take-away that wine, cheese and bread aren't for "real men?" Come on. I actually didn't catch it during the game, but I was in a loud bar rooting for the Giants and could've missed it. I saw it later on MySpace's Super Bowl Ads page, where you can view the whole ad now (look for the section called 1st quarter and click on the Bud Light ad all the way at the right).